I'm fairly certain that I looked like a fool jumping up and down playing Adrenalin Misfits at the Konami booth today. I was told by the Konami PR representative that Microsoft is only planning to launch Kinect with 15 titles, which will be a mixture of first and third party software. Konami is hoping that some of the titles that it's been developing for the new camera technology will be among those fated 15, including the one that I got to play, Adrenalin Misfits. Misfits pits a bunch of anthropomorphic animals against each other in racing games such as slalom snowboarding and surfing down a river. The animals have an edge to them with their spiky hair and bad attitudes, they are participating in "extreme" game after all, but it's clear that Konami is tapping into the family-friendly market that Kinect is supposed to draw with this title. This was my first experience playing with a Kinect game. I was initially unimpressed with navigating the menus, but, like learning how to interface with the Wii remote, I needed to learn which actions were the language of the user interface. Waving means that you're ready, akin to pressing start, while the menus move by sweeping your hand left or right. I selected the minigame that I wanted to play, the river water boarding one, by holding my hand out in front of me. The race started and I quickly fell behind. The demonstrator told me that I had to lean forward if I wanted to go faster, which I did with little to zero noticeable effect. The other way to gain speed boosts was to perform tricks. I jumped in the air when my character was going over a ramp, and sure enough, he did a 360. If I kicked my leg out, the 360 became a flip. Other gestures performed different tricks, but I honestly couldn't figure out how to do them all. Nailing a trick was the hard part. If you were in the middle of a turn when you hit the water, you'd get a speed penalty. To stop circular movement in the correct orientation to land the trick, you had to stick your arms out. The first time I did this, I stuck them out sideways, with one arm facing the display and the other pointing behind me, but the Kinect has not perfected the science of x-ray vision. It couldn't tell that my arm was out on the other side of my body. The next jump I stuck my arms out parallel to the display and landed the trick, giving my spiky haired hedgehog, or whatever, a speed boost. I still came in last. I tried the snowboarding game next. Steering worked the same, by leaning in one direction or another, just like real snowboarding. I could jump and do tricks anywhere on the snow, and you could say that I "spammed" the 360 as that's the only trick that I could perform consistently. This time, I was able to steer pretty well and keep the speed up. I came in first, leaving those other sorry animals in the dust. Or snow or what have you. I looked at the gamers who had stopped to watch me play and was briefly embarrassed at my flailing jumps and kicks. 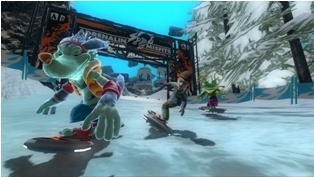 Adrenalin Misfits is exactly the kind of game that you would expect for use with Kinect. I'll leave that statement up to your interpretation. As I said, there's no release date as Konami isn't sure that it will be in the launch library for Kinect. Even if it's not, you can expect that many Aunt Sallys will buy this game for their nephew soon after Kinect is released. Keep track of all our E3 2010 coverage here.